Eleven Park students were honored in the 2019 Regional Scholastic Art & Writing Awards, receiving a total of 28 awards and honorable mentions in both art and writing. Presented by the Alliance for young Artists & Writers, the Scholastic Art & Writing Awards is the longest-running, most prestigious recognition program in the country for creative teens. Since 1923, the Awards have recognized the vision and ingenuity of our nation's youth. Students across the country submitted 350,000 works of art and writing to the Scholastic Awards in 29 categories last year. Panelists consider works that best exemplify originality, technical skill, and the emergence of a personal voice or vision. Several Park students received multiple awards, including senior Celka Rice, who received six honors in art: two Gold Key Awards, two Silver Key Awards, and two Honorable Mentions! All Gold Key works will be considered for national-level recognition. Congratulations to all of Park's Scholastic honorees! 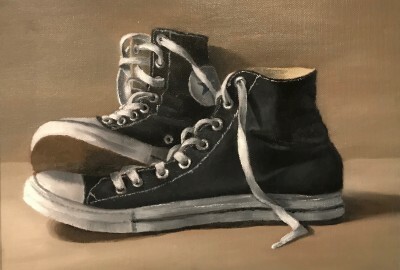 Photo Caption: "Chucks," a painting by Oli Brauer ’22, received a Gold Key Award.